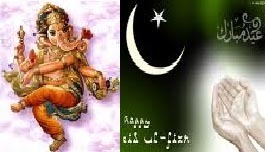 11 Sep ; The country wears a festive look Saturday as People from all over the country gears up to celebrate Ganesh Chaturthi as well as Eid-ul-Fitr after completion of the 30-day fast during the holy month of Ramzan. Namaz being offered at mosques with Muslim brethren greeting each other with sweets and Hindus welcoming Lord Ganesha amid pomp and gaiety as the elephant-headed God arrives in his devotees’ homes and pandals (marquees), marking the commencement of the 10-day annual festival. Idols of all shapes and sizes of Lord Ganesh, considered the destroyer of the evil, installed after traditional pooja. The enthusiastic voices of “Ganpati Bappa Morya” being reverberated in unison as the idols worshipped with singing of ‘artis’ like “Sukhaharta Dukhharta…” amid bursting of crackers and beating of drums. A thick security blanket has been thrown in the metropolis following reports that two suspected foreign terrorists have sneaked into the city to cause disruption at crowded places and religious congregations. Devotees feasted on the Lord’s favourite delicacies like `karanji’ and ‘modak’ after offering the `Aarti’. Apart from politicians, Bollywood stars also celebrate the popular festival by worshipping the Lord at their homes. Railways, Navy and NGOs have joined hands to ensure a smooth and trouble-free festival. The civic body has made arrangements like road diversions, watchtowers and sanitation. Railway is running additional trains to ensure swift movement of devotees. Special arrangements have been made for devotees at the city’s most revered Ganesh idol, `Lalbaugcha Raja’ (King of Lalbaug), which attracts lakhs of people.